Susi D. Jewelry features delicate, feminine jewelry, that adds just the right amount of sparkle to a woman’s day. She has taken hand-crafted jewelry and paired it with sentiment cards that are wrapped in a beautiful box with bow that are ready to be gifted. With Christmas only a few short weeks away why not surprise that special person in your life who helps make your world go round with an amazing piece of jewelry and personalized card from Susi D. Jewelry. Jennifer at Life of a Southern Mom had the pleasure of working with Susi D. Jewelry and reviewing one of her beautiful pieces for herself. Visit her website here to see her full review. Jewelry and the holiday season go together so well. The jewelry offered by Susi D. is just so gorgeous. I am sure you are going to find at least one thing that catches your eye. What a great giveaway this close to Christmas! 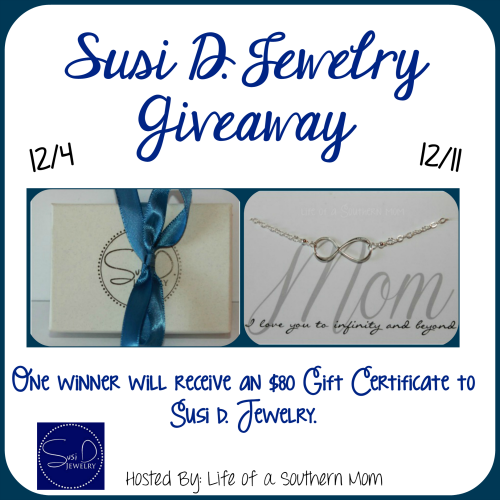 Prize: One winner will receive an $80 Gift Certificate to shop online at Susi D. Jewelry. I loved the Purple and Green Drop Earrings! So pretty! I love the Dream necklace in silver. I really I really like the Extra Long Blue Quartz Necklace. So many pretty things to choose from! I love the compass necklace in gold.